A really candid and stylish picture. The ladies look like they’re having super time. Loving the white socks and heels. Finally a full-length photograph…those bobby socks rock! the black slides and white socks are amazing! Well , well ,well! White socks are a supreme statement! Love the joy and pleasure these signorine are expressing. 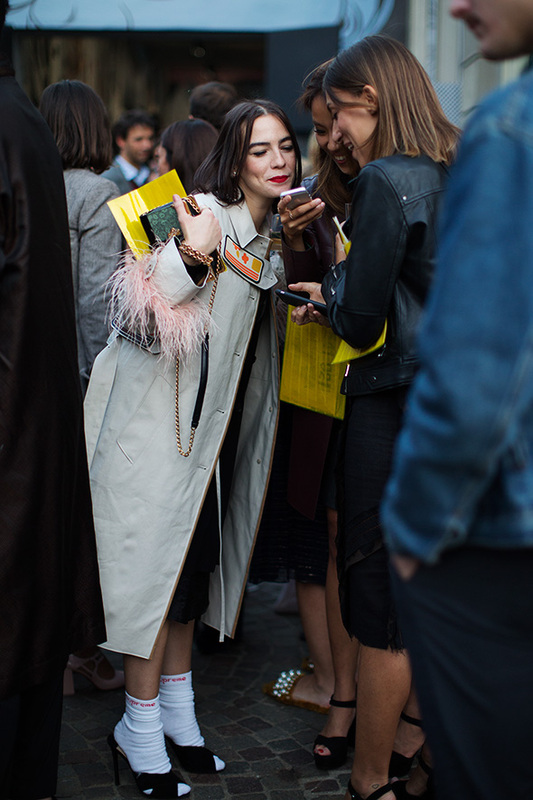 Maybe they’re looking at The Sartorialist on their cell phones? I know I am old-fashioned- but I think whoever thought of socks and heels should have refrained from having white socks and salmon colored ostrich feathers in one outfit. Really?…this is nothing…some out there wear it all and some more…minus the kitchen sink! The question is how much was paid for these basic awful tennis socks, to just have a Supreme tag ? I honestly find that this Supreme craze is the epitome of fashion ridicule. It’s just a fad dear…and like everything in fashion…it passes! Is anyone else bothered by the odd placement of feet. Some of them appear to be attached back to front! Isn’t that how you identify Russian witches? They remind me of some teenage girls right after school lets out for the day: Now we can twit, post and tag in peace! I am not a fan of this particular use of socks trend either but fads do come and go and this one has been doing the rounds since the fifties so no biggie. Sometimes we need to remind ourselves of the joy of being young. Enjoy ! I’m still not a fan of socks and sandals trend. Cut the feet, I love this outfit. Wow! so much feminine charm in one photo! A Sartorialist classic! I ask you to explain how to walk with socks and high heels without the foot slipping dangerously in the shoe. Did you try it already?